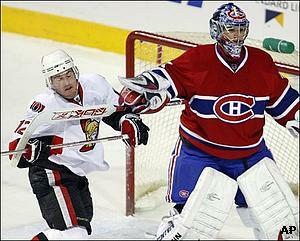 The Montreal Canadiens have been dominated virtually all season when they've faced the Ottawa Senators. But the Senators would gladly trade that success for the Canadiens' spot in the Northeast Division. Montreal looks to move one step closer to its first division title since 1991-92 when it hosts second-place Ottawa on Monday. The competition between the Eastern Conference-leading Canadiens (42-24-10) and the Senators (41-27-7) has been extremely tight at the top of the division over the past few months, with Montreal's current five-point lead its largest advantage of the season. But when the teams have faced each other on the ice, it's been Ottawa that has enjoyed a decided advantage. The Senators have won five of the six meetings this season and eight of the last nine overall. They've outscored the Canadiens 9-1 in their two most recent games, including a 3-0 victory at the Bell Centre on March 13. That victory was the Senators' third straight and tied the teams atop the division, but Ottawa has since lost two of three while Montreal has gone 3-0-1. The Senators held a 4-3 lead at home against Toronto on Saturday night heading into the third period, but gave up two goals in 41 seconds on their way to a 5-4 loss. 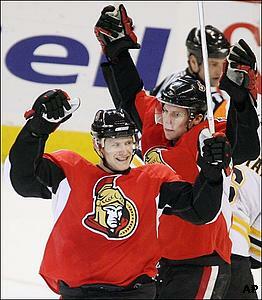 "We know we can play better," said Ottawa captain Daniel Alfredsson, who scored his 38th goal. "If we want to win down the stretch and in the playoffs we can't give up goals like that." The line of Spezza centering Alfredsson and Dany Heatley has been the NHL's most productive this season, combining for 106 goals. But the trio hasn't played any better than when they've faced the Canadiens. Spezza has seven goals, Alfredsson four and Heatley three against Montreal in only five games apiece, and they've combined for 36 points. "They're probably one of the best lines in the NHL," Canadiens goaltender Carey Price said after watching that line score every Senators goal in a 6-1 loss on Feb. 9. Price has lost both of his starts against Ottawa this season, but the rookie has been playing well lately as Montreal has taken control of the division. He's 4-2-0 with a 1.97 goals-against average in his last six starts. The comfort of home ice has made a big difference recently for Price. He's 4-1-0 with a 1.38 GAA in his last five starts in Montreal, compared to 2-2-0 with a 3.26 GAA in four road starts this month. Price had another excellent home outing on Saturday, making 33 saves and not allowing a goal in the shootout as Montreal beat Boston 3-2 to sweep its eight-game season series against the third-place Bruins. "We need to get every point we can," Price said. "Even though we had one point going into the shootout, we knew we had to get that other one." The Canadiens lead the East with 240 goals - two more than the Senators - but they feature a more balanced attack than Ottawa's top-heavy scoring load. Seven players have at least 15 goals, and four have at least 22. Alex Kovalev is Montreal's leading scorer, but of his 33 goals, only one has come against Ottawa - back on Oct. 18. That's the only goal he's scored in the last 10 games in the series. Though Mike Komisarek doesn't have a point against the Senators this season, his presence will be missed on the Canadiens' back line. The rugged 6-foot-4, 242-pound defenseman, who leads the team in hits and blocked shots, will miss the remainder of the regular season due to an apparent groin injury.